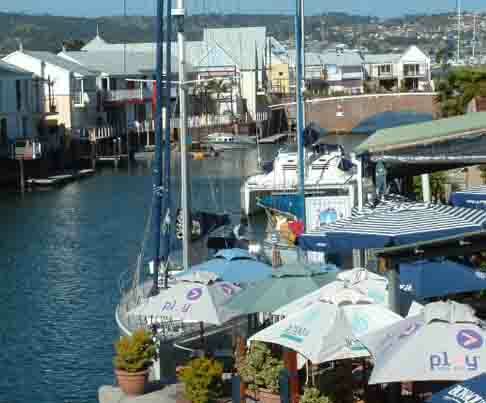 Knysna is the oyster capital of South Africa. Each year in the July school holidays the town puts on an Oyster festival. As part of the festivities a number of cycle races and road marathons are held. These activities are extremely popular with the public and accommodation is hard to come by during the festival. Also on the menu is the Knysna oyster which gives the festival its name. Since the early days of Knysna, oysters have been readily available in the area but due to demand collecting them in the wild is no longer commercially viable. The cultivation of oysters was first muted in 1946 by a retired wine merchant in the Knysna area. After two years of research and an inspection of the Knysna lagoon a Dutch oyster farmer was employed to start an oyster farm. Various species of oyster were imported and a bottom farming method was employed which turned out to be unsuccesful. It was then decided to try and use the local oysters but catching the natural spats using various methods also turned out to be unsuccessful from a commercial point of view. The main problem being a lack of knowledge of the local conditions which made methods used successfully in Europe unsuitable in Knysna. Local predators and pests also fed on the baby oysters creating more problems for the farmers. Between 1965 and 1970 various methods of cultivating oysters in the lagoon were tried most of which had limited success. A hatchery was established in the lagoon near Belvedere but was closed down because of problems with pollution, bacteria and the slow growth of the oysters being cultivated there. It was then decided to import the oyster seeds from overseas. 3 - 4mm oyster seeds are imported from either Chile or France and on arrival in South Africa are placed into a specially designed nursery in Port Elizabeth where the oysters lie in bins with mesh screens for bottoms and fresh salt water is pumped through them. The oyster seeds grow quickly and after about three months grow to between 10 and 12 mm in length. When they reach this size they are removed from the oyster bins and transferred to the Knysna lagoon where the next phase of their development begins. In Knysna the oysters are placed in fine mesh bags and are tied onto inter tidal racks anchored in the lagoon where they are exposed to the elements during low tide and are submerged at high tides. This exposure reduces the risk of parasites and keeps the bags that the oysters are kept in free from marine organisms that would attach themselves if the bags were constantly underwater. During this phase the oysters are regularly graded and by spending time out of the water their shells are strengthened and they become accustomed to living out of water extending their future shelf life. Unfortunately during this process more than 40% of the oysters do not survive. After about nine months the oysters have grown to about 45mm and are then ready for a move back to Algoa Bay for the final process of their cultivation. On arrival in Algoa Bay the oysters are placed in lantern nets which are attached to long ropes which are kept afloat by buoys far out in the bay. Here they live for about three months in the open sea in perfect conditions for oysters. When they reach marketable size and the plumpness of sea grown oysters they are harvested and brought back to land where they are scrubbed and graded into different sizes. They are then placed in crates and kept in cement tanks filled with fresh sea water which is drained for a number of hours each day. The oysters are now ready for delivery to the markets. It's a strange thought but in many instances the oysters you buy in Knysna will be more well travelled than you or me are.